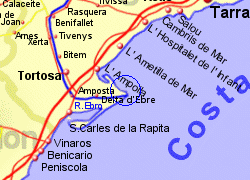 The modern (and modest, low-rise) development of Riumar lies at the north east tip of the River Ebro delta (and within the natural park), 10Km east of the busy town of Deltebre. The urbanisation lies next to sand dunes and a natural golden sandy beach (which has been awarded a blue flag in recent years), where there are a small number of chiringuito beach bars and restaurants. 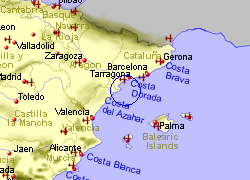 There are also bars and restaurants on the banks of the river Ebro which lies 1Km to the south, along with a marina. Fishing is available on the river banks and the whole area is a haven for aquatic birds. The main industry in the area is agriculture, with approximately 15,000Ha of rice being grown on the delta. 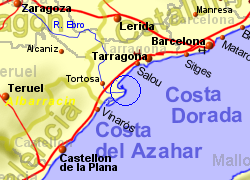 Map of the Riumar area.